The Wafer is a classic biscuit from Montecatini Terme made according to a traditional recipe that has been handed down from generation to generation to ensure that those who savour these fine wafers will find themselves embarking on a unique sensory experience. 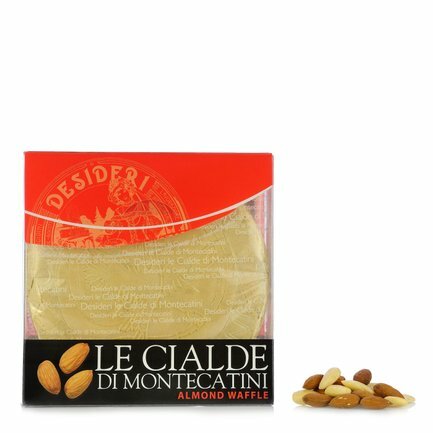 The wafers are composed of sweet and crumbly vanilla flavoured layers prepared by hand and dressed with Apulian almonds. The Wafers are perfect with ice cream, fresh cream, fruit or as an tasty accompaniment to your afternoon tea. Ingredients Almonds, sugar, “00” type soft wheat flour, whole milk, eggs, vanilla flavouring. ALLERGENS: milk, eggs, flour and vanilla. For more information on product labels, please contact our Customer Service department. The information on the labels of the products may vary for reasons beyond our control, therefore, there may be discrepancies between the information on the site and that on the products delivered. Please always check the information on the product before consumption or use. For more than a century the Desideri family has been following a path of quality research while pursuing constant technological innovation that is fully compatible with the exquisite traditional recipes and ingredients grown in the area. The philosophy of the firm is focused on meeting the demands of even the most discerning customers, offering flavours that are consistently excellent and distinctive.